No music – just the soothing sound of slowly swirling white noise that gently absorbs your attention without prompting any particular emotional response. In this way, Pure White helps to sweep away mental clutter and leave you with a quiet, open mind that is primed for altered states of consciousness like meditation, hypnosis and sleep. Please listen at a quiet volume. This music is also available with brainwave entrainment frequencies. Click here for previews and more information. White noise is an incredibly effective sound-source for encouraging deeply relaxed states of consciousness. By itself, white noise is a completely characterless sound, but it can be “sculpted” into something much more interesting. I do this using frequency equalizers and frequency filters. I start by using frequency equalization to shape the overall tonality of the noise (making it brighter or darker for example), and then I use frequency filters to emphasize or de-emphasize certain frequencies, and then vary those frequencies over time. This creates a sense of movement that can be very hypnotic. 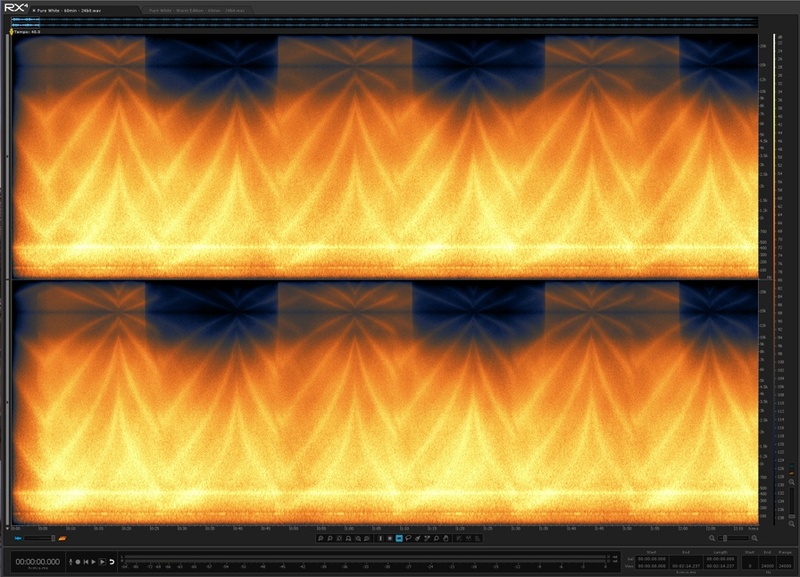 I can vary the speed, intensity and complexity of this frequency modulation to sculpt the white noise however I like. 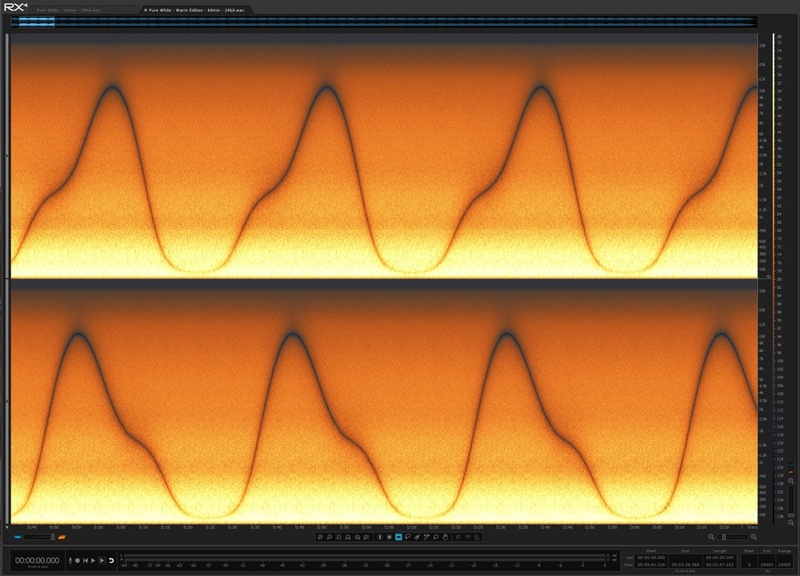 It’s fascinating to see how the sculpted white noise looks when viewed using a frequency spectrum analyser. I must admit that even I was surprised when I first saw the sound of Pure White as it is shown in the images below. In each image a three minute period of sound is shown. The top half of each image shows the sound coming from the left speaker, and the bottom half shows what’s coming from the right speaker. The lowest frequencies are at the bottom of each half, and the highest frequencies are at the top. Brighter areas are louder, whereas darker areas are quieter. (Please note that the colour of the sound spectrum is not significant - the frequency analyzer program I use can show the sound in any colour). Try listening to the audio samples of Pure White to see if you can correlate what you hear with what you see. It can be a bit tricky to do this, as some of the frequencies are very high and some are very subtle, so don’t feel bad if you can’t quite match up what you see with what you hear. Just try it for a bit of curiosity and fun. Which one is right for you? The original Pure White or the Warm Edition? There’s no right or wrong answer here. Neither version is a more effective relaxation tool than the other so it’s really a matter of personal taste. There’s room for both versions in your collection as both present quite a different soundscape to enjoy. 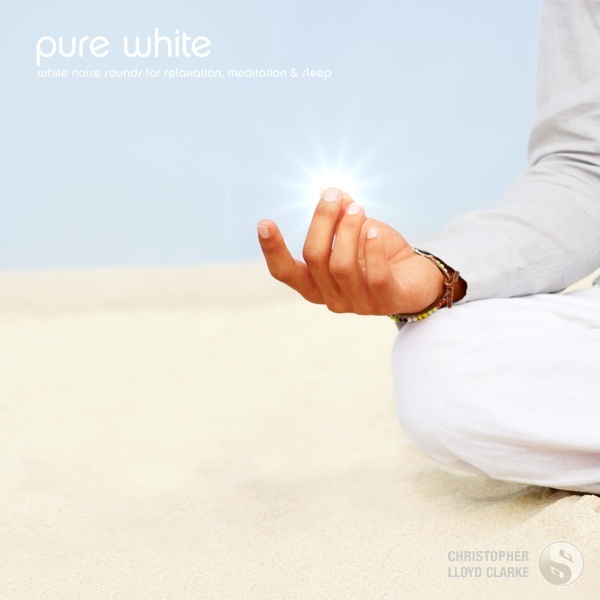 In my opinion, the original Pure White has a slightly “cerebral” feel to it that works really well for clear meditations, whereas the Warm Edition tends to bring on feelings of body heaviness which makes it great for hypnosis and sleep. Having said that, these two version are both VERY versatile and I really don’t want to pigeonhole them into specific roles. You can use both of them with equal confidence anytime you need a subdued relaxation / concentration aid that won’t stimulate emotional responses like traditional music does.